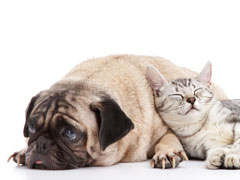 Middlesex Veterinary Center recommends spaying or neutering your pet unless it is certain he/she is to be bred. Females- A lowered risk of breast cancer, especially if spayed before the first heat cycle; Eliminated risk of uterine and ovarian cancers and infections. Males- Eliminated risk of testicular cancer and virtually eliminates the risks of cancer, abscesses, and hyperplasia of the prostate gland. As well as the health advantages, spaying and neutering helps reduce behavioral issues such as roaming, aggression, and marking. Although spaying and neutering can be done safely as early as 2-4 months old, we recommend it be done at 6 months of age in order to check for deciduous teeth (retained baby teeth) which can be removed during the spay/neuter surgery.